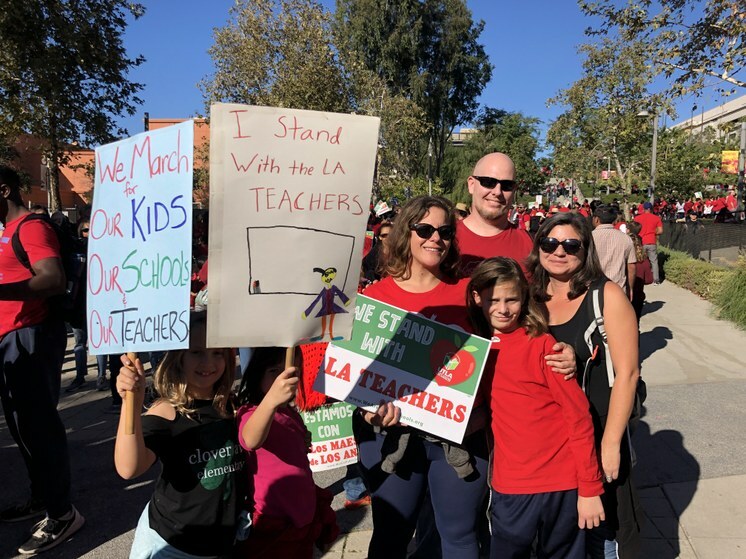 Public school teachers in Los Angeles are getting closer to walking off the job next month — it would be the first teacher strike to hit the LA Unified School District in 30 years. But contract negotiations with the district have hit a wall. Over the weekend, thousands of union members - teachers, librarians, counselors- took the streets of downtown LA to show that they’re serious. 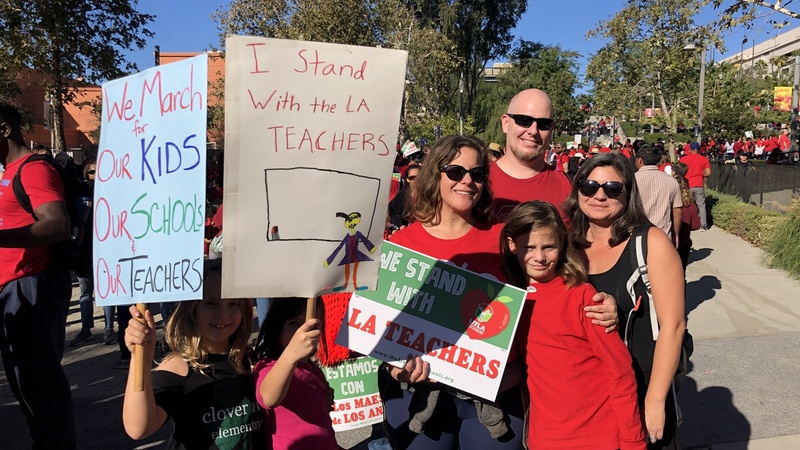 KCRW’s Jenny Hamel was at the demonstration and spoke with dozens of educators about what they’re experiencing in the classroom and what their demands are. How likely does a worker strike look? Do LAUSD parents need to start planning to stay home with their children come January? It’s not clear that either side is about to make any concessions. A strike in early January looks very likely. Some teachers spoke about a strike as a certainty, but they’re waiting for the signal from UTLA leadership. As for the students, schools are set to remain open during a strike. And many of these students rely on school, not just to receive an education, but for care during the day while parents are working and for free lunches. One teacher at the march said they’ll probably be crammed into an auditorium, being guided by the “school accountant.” Many of the teachers I spoke with, who have kids in school at LAUSD, say they will bring their kids on strike with them. On Saturday, thousands of educators marched through downtown LA in union red. This was billed as a kickoff to a potential strike organized by the United Teachers Los Angeles. Who was there? There were plenty of teachers, but they were also joined by school nurses, librarians, parents and even students came to support. 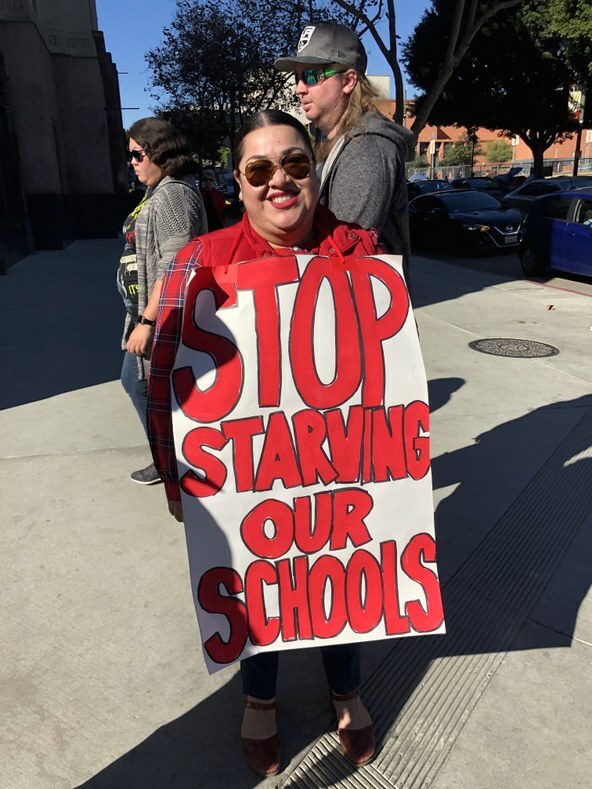 They chanted slogans and held signs like “Stop starving our schools.” The union members wanted to send a message — that charter school backers like Eli Broad are sending the district in the wrong direction. 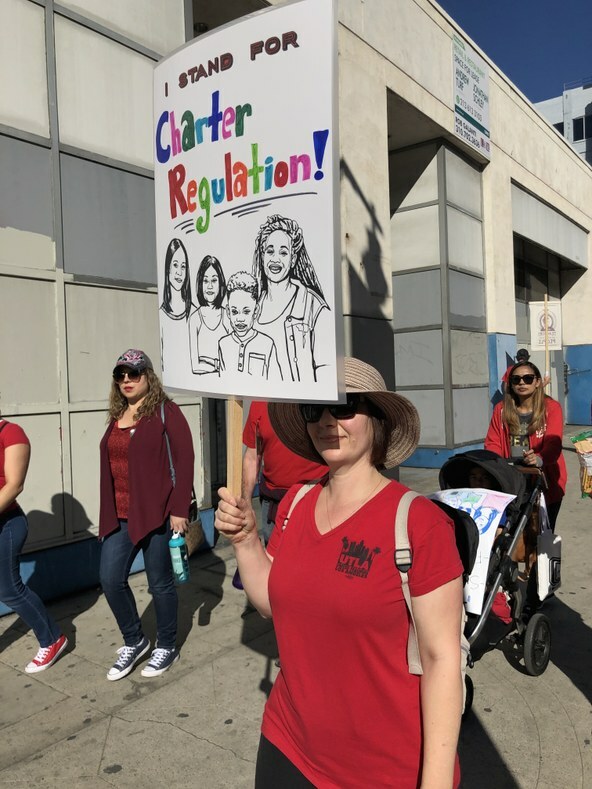 In fact Morri Spang, a math and science teacher at San Pedro Street Elementary, who was at the march, called this an existential battle between the survival of public schools and privatizers like Superintendent Austin Beutner. The union wants higher salaries - a 6.5 percent raise retroactive more than two years, limits on charter schools, smaller class sizes, less standardized testing, full time nurses and other staff. I talked to Traci Bullard who teaches kindergarten at West Vernon Elementary in East LA. She says her campus need more resources. How did we get here —Where are negotiations now and what should parents expect next? The two sides have been in court ordered mediation. Now, they’re looking over what’s called a “fact finding report” -- released by a panel that heard from both the union and the district. This fact finding report is the last step in the negotiation process before the union can reject an offer and strike. Over the weekend, UTLA president Alex Caputo Pearl gave a rousing speech and said “the time is drawing close” to take action. You really got the sense that after 18 months of contract talks, the union members are absolute ready to form picket lines, which would be massively disruptive to the nation’s second largest public school district. What are district officials saying about all this? District officials have been more tight lipped than the union in last couple weeks, but what Superintendent Austin Beutner has said is that the LAUSD cannot afford to meet all the union’s demands- that they would cost $750 million over a three-year span and that the school system is facing insolvency in two to three years. But almost every educator at the march said they believe the district is sitting on a nearly $2 billion reserve. The fact finding report should clarify what the math is and how much money the district has. Esther Herrera, a teacher at Willow Elementary School in South Gate, says the district is sitting on a nearly $2 billion reserve that could be used for resources for classrooms. Photo credit: Jenny Hamel. Do you have questions about the possible strike?